The National Aeronautics and Space Administration came into being on October 1, 1958. 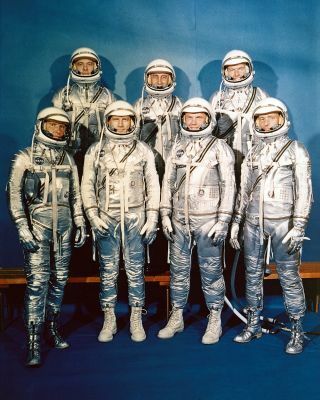 NASA announced the seven Project Mercury Astronauts on April 9, 1959, only six months later. They are: (front, l to r) Walter H. Schirra, Jr., Donald K. Slayton, John H. Glenn, Jr., and Scott Carpenter; (back, l to r) Alan B. Shepard, Jr., Virgil I. Gus Grissom, and L. Gordon Cooper. Mercury represented NASA's first human spaceflight program, with the aim to see if humans could function effectively in space for a few minutes or hours at a time. The first seven astronauts were chosen in 1959. Above: Dr. Von Braun, right, worked directly with America's first seven astronauts. This photo is believed to have been taken about 1959 in the Fabrication Laboratory of the Army Ballistic Missile Agency in Huntsville. Gordon Cooper was a NASA astronaut who flew twice in space, during the Mercury and Gemini programs. On his last flight, Gemini 5, Cooper and crewmate Pete Conrad set what was then a world endurance record of the time of 190 hours 56 minutes. Walter "Wally" Schirra was the only astronaut who flew in the Mercury, Gemini and Apollo programs. Named as one of NASA's "Original Seven" Mercury astronauts in 1959, he remained an astronaut long enough to fly the first manned mission of the Apollo command module that eventually ferried crews to and from the moon. He also sat through a pad abort during the Gemini program. Scott Carpenter was one of the first seven astronauts selected by NASA. He flew only once in space before shifting his attention to underwater activities for much of his remaining career. Some sources say he was not allowed to fly in space again after overshooting his re-entry target by about 250 miles (400 km). In 1959, John Glenn was selected as a Project Mercury astronaut. On Feb. 20, 1962, Glenn blasted into space aboard Mercury's Friendship 7 capsule, then traveled around the planet three times, becoming the first American to orbit the Earth. Glenn made history again when, at the age of 77, he became the oldest person to travel in space. Virgil "Gus" Grissom was a NASA astronaut who flew twice in space and was selected to command the first Apollo manned mission as well. He died, however, when a fire erupted in his spacecraft in 1967 on the launch pad, which killed his two crewmates as well. The incident prompted many changes in the Apollo program. Alan Shepard became the first American in space when the Freedom 7 spacecraft blasted off from Florida on May 5, 1961. Ten years later, Shepard would leave Earth's atmosphere again to become the fifth man to walk on the moon — and the first one to play golf there.